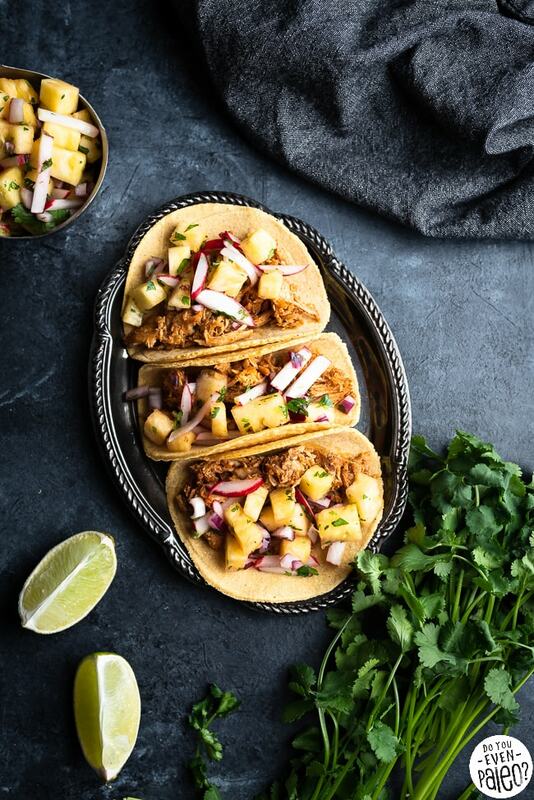 Gluten free and paleo-friendly, these smokey Pulled Pork Tacos with Pineapple Radish Salsa are sure to be a warm-weather hit! It’s my birthday, so of course it’s on brand for me to have tacos! After all, my birthday serendipitously fell on TACO TUESDAY this year. I couldn’t have asked for life to line up more conveniently! 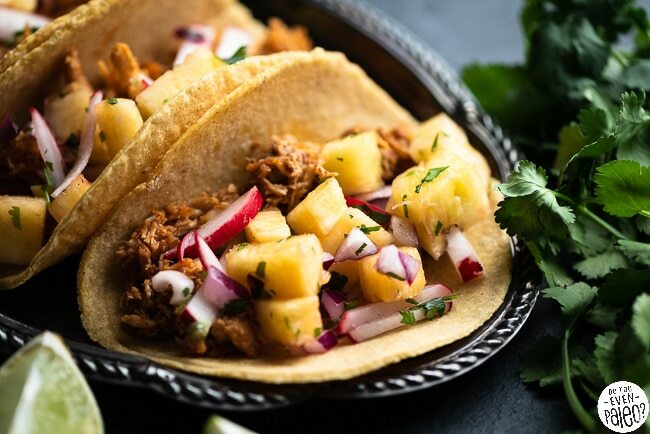 Even though I’ve shared numerous taco recipes in the past (and even wrote an e-book with more), I’d be remiss if I didn’t share a NEW taco recipe on my Taco Tuesday Birthday. 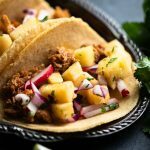 Before we dive into the recipe, I want to share a few tips for making epic gluten free tacos any day. Now, you can find many of these tips in my free e-book, but it’s my damn birthday so I figured I’d dish out a few here, too! To start with, the best tacos need a good base. That means tortillas. For this recipe, I’m not sharing a specific tortilla recipe — you can pick one that works for you. For the pics here, I made two-ingredient corn tortillas. Paleo cassava flour tortillas are another favorite of mine I’d consider using, too! 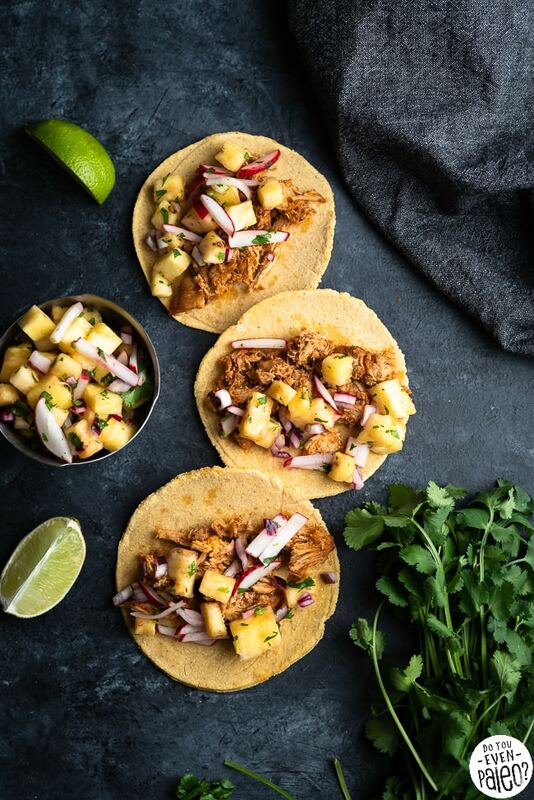 You can find both of my recipes for those tortillas in the taco e-book I already mentioned — to get it, just sign up for my newsletter. Simple! Still, those aren’t your only tortilla options. I think this recipe would work well with my plantain tortillas, too. The sky’s the limit, so pick your favorite (even if that means picking up a package of Siete Foods tortillas at the store!) and enjoy some taco heaven. Beyond the tortillas, here’s one of my favorite taco tips: it’s all in the toppings, baby. In your heart, you know this is true. When’s the last time you had tacos with just a tortilla and meat? I’m going to go out on a limb and guess if you have done that, you were pretty disappointed with the results. Toppings are an important part of tacos! And part of what makes them fun is that you can use them interchangeably with a variety of taco creations. The pineapple radish salsa here? Don’t think you can ONLY pair it with this smokey crockpot pulled pork. It would go great with fish or shrimp tacos — hell, we ate the leftovers with basic ground beef tacos and definitely enjoyed every bite. 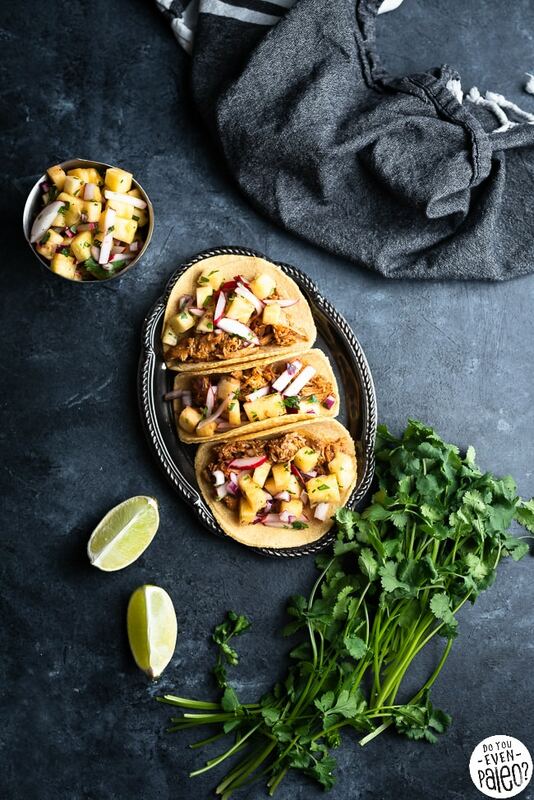 Okay, I know I’ve mentioned it a lot — my free taco recipe e-book that I gift to all my newsletter subscribers! It’s called Tacos Every Damn Day and I put a TON of work into it. 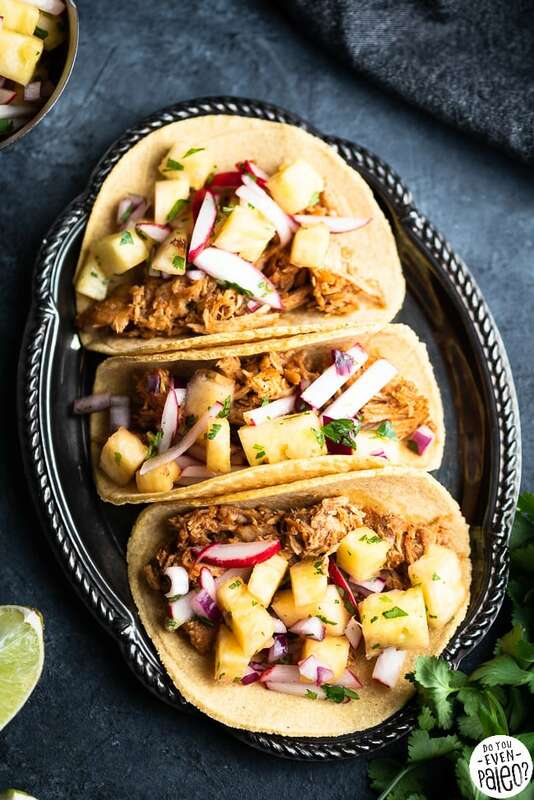 It’s got taco tips, tricks, and numerous recipes to help you craft a different awesome taco creation every day, if you want to eat tacos super frequently like me. 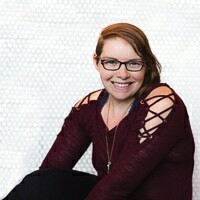 If you want to learn more about it, check out this announcement post! If you want to just sign up, fill out the simple form here. 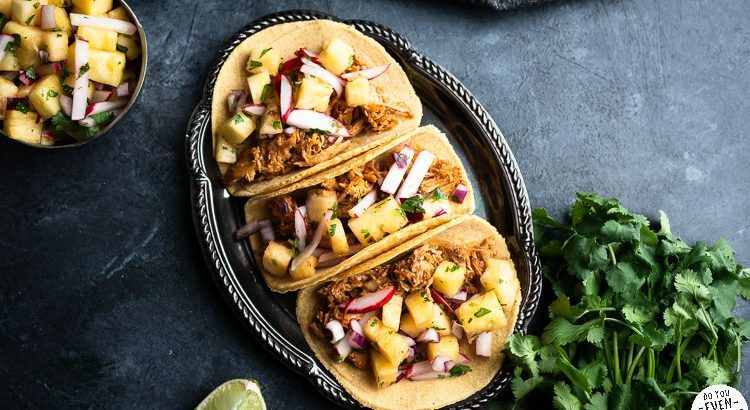 And if you’re not interested in the e-book, check out some of my other taco creations below, including the paleo pulled pork tacos recipe! 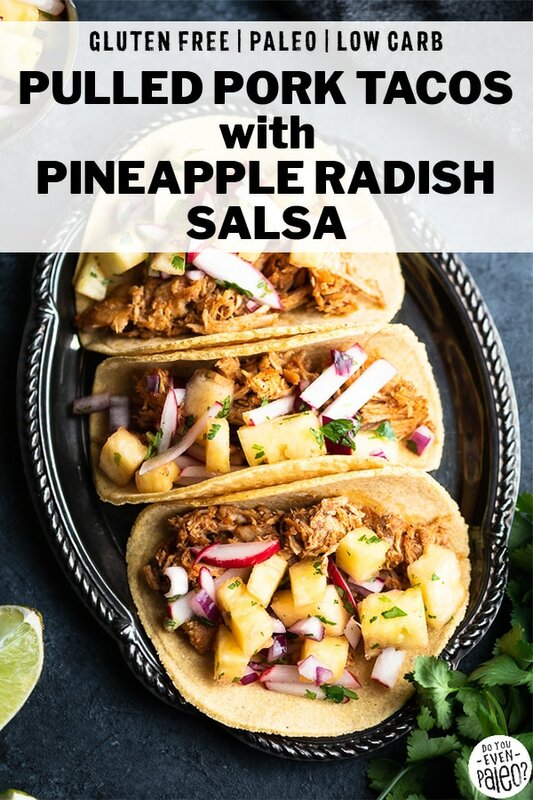 Smokey pork and juicy pineapple make a perfect pairing for these Gluten Free Pulled Pork Tacos with Pineapple Radish Salsa! Use your favorite storebought or homemade tortillas. First, prep the pork. Combine the smoked paprika, ground black pepper, sea salt, onion powder, garlic powder, and cayenne in a small bowl. Rub the pork roast with the spice mixture, covering every nook and cranny of the roast. Add the roast to a slow cooker and pour the water into the bottom. Cook on HIGH for 3 hours or on LOW for 7 hours. At this point, the pork should shred easily with two forks. Reduce the slow cooker to WARM while you prepare the tortillas (if necessary) and salsa. 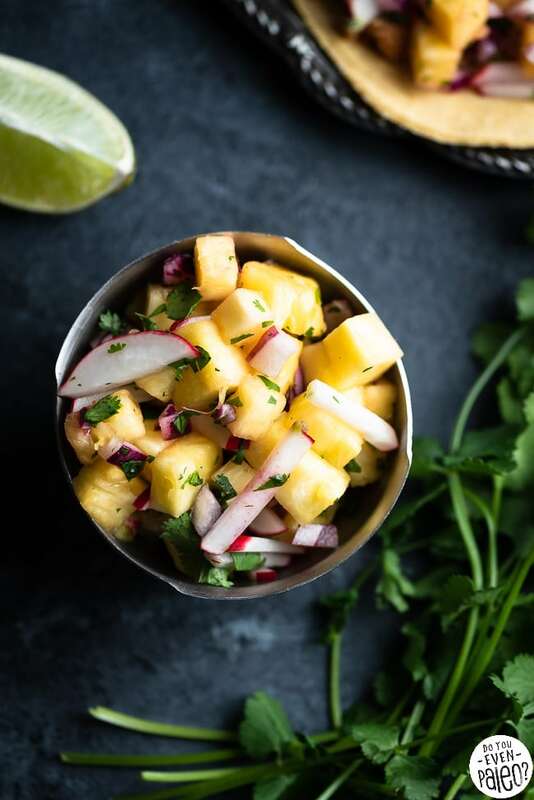 To make the salsa, add the pineapple, radish sticks, red onion, cilantro, and lime juice in a large bowl. Stir to combine. 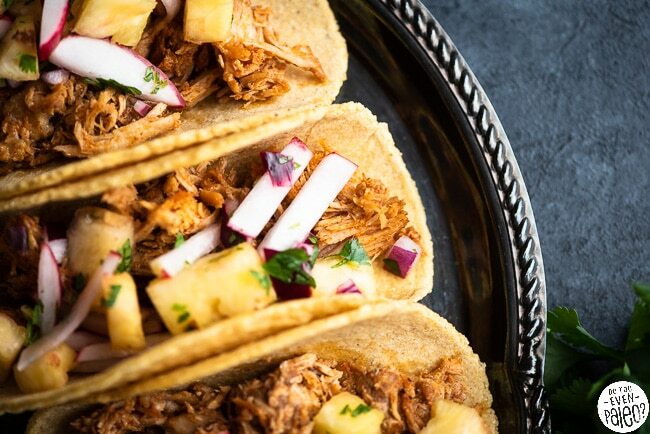 Assemble the tacos by adding a couple tablespoons of pulled pork across a tortilla. 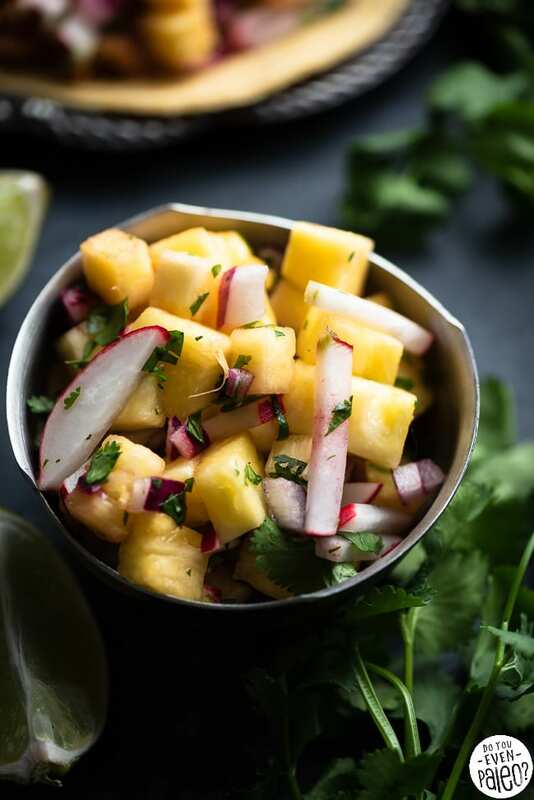 Top with the pineapple radish salsa and garnish with additional cilantro if desired. Eat immediately. Cook times will vary by the size of your pork roast; adjust as necessary. If using a pork shoulder roast, you can omit the water – I only find it necessary for lean cuts, like pork loin! Don't subscribe All Replies to my comments Notify me of followup comments via e-mail. 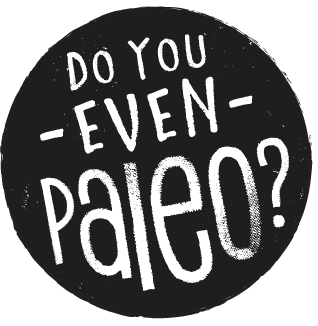 You can also <a href='https://www.doyouevenpaleo.net/comment-subscriptions/?srp=7364&srk=87505361eee98908ddf6ccb8681f50d6&sra=s&srsrc=f'>subscribe</a> without commenting.